Although we’re anticipating fall soon, this week in NYC was all about spring. 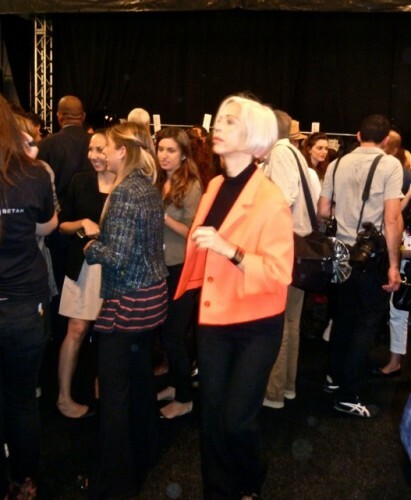 Yesterday I attended some of the Spring 2012 shows at Mercedes Benz Fashion Week. After several seasons now at Lincoln Center, the producers of the event, IMG, really have it down pat. Everything seemed to move like clockwork. First on the agenda for me was Michael Kors. You can always count on him for some version of classic glamour. The inspiration for this show was “memories of Africa” done the Michael way – “the rustic modernism of the Lebombo Lodge…soft djellabas and caftans…raw beauty… artisanal textures…earth tones of limestone, olive and clay…” And if this is his vision of a trip to Africa, sign me up! The earth tone colors, animal prints and feathered effects done in textural silks, linens and cotton were the epitome of rustic chic. A clay washed poplin poncho and safari romper. A fabulous tiger print duchesse trench. Leopard hand painted feathered handkerchief gown. Many of the pieces just floated as the models moved quickly (too quickly for me to capture) for me to get great shots. I’ll be very curious to see how these runway pieces translate to the collections in the store. And the clothes go back on the racks. It was a who’s who of fashion week – Michael Douglas (minus wife) to the gorgeous Zoe Saldana, below, (with a fast moving Rachel Zoe behind – thanks Ridgely for your eagle eye). Even if you stay at home next spring, Kors’ “Afriluxe” collection will allow you to travel vicariously – in style of course!! This entry posted in fashion. Entry Tags: Mercedes Benz Fashion Week, Michael Kors, New York Fashion Week, Spring 2012 fashion Bookmark the permalink. Fun fun fun… and this is why the hotel rooms were so expensive…coming to NY on Sat. Gorgeous! Not that this resembles any Africa that I have ever been to but I love the glamour of MK’s version. ;) Thanks for sharing this Q, including the backstage. Looks as if Glenda and Rachel Zoe are in the same dress–heehee. Looking good, Michael Kors is geting better and better. So exciting to be at a show, have attended two, one was Badgley Mischka, it was soo exciting and wonderful and glamorous. This is New York at its best..thanks for sharing! MK does such great collections. I am noticing more and more of his handbags and good on the streets these days. I like him, I think he is smart, creative and this show had some stylish touches of Bill Blass and Geoffrey Beene to me. Nothing better than a well done runway show. Looks fun! I never go, but now I want to check out the scene. Loved the handkerchief dress. How fun to get behind the scenes……….lucky you! I love MK but couldn’t wear any of these pieces to young for me but I know they’ll change for us real people. What a fun job you have! So much fun! I loved seeing it through your eyes. I thought Mr. Kors looked fantastic. Loved the tiger print trench — that might need to come live in my closet. I’ve got a little Kors in my post today, his interpretation of Safari Chic really captures the imagination. Fun! 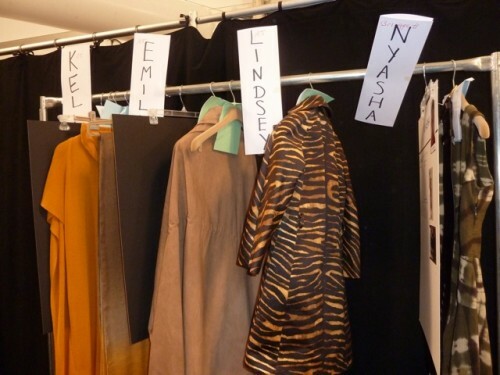 love all the safari prints and who’s who backstage moments! It’s a wonderful collection. How fun to get to be in the middle of the action!! How lucky are you??? My brother-in-law worked for Michael for three years and I never got an invite!! Hmmm… don’t know about the safari look but will give it the benefit of the doubt! Hello Old chum, I thought I’d get my Augusts posts out any day, but alas one thing happened after another. Anyway business is humming along. I’m impressed with your access! Come by, we have a killer sale!! What a fun event; I love his designs and, from someone from the back blocks of Oz, I’m proud to say that I have a pair of MK shoes bought in NYC and a rather unusual watch designed by him. 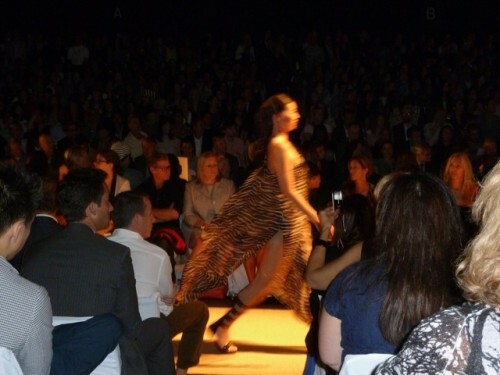 great photos–Michael Kors is my favorite and I never tire of a good animal print! wow. I must say, you have the most exciting life of anyone I “know”! love the collection! did you see the dateline show on young models in nyc last night? very interesting. such pressure and stress. and, that is exactly why I decided not to be one;););)!!! Loved this back stage pass! This entire collection is fierce! I don’t know that I quite have the guts to wear a tiger print trench but Michael Kors did inspire me to seek out some great zebra print accessories. I want that leopard caftan NOW. What a treat that you got to see all this. I’ve been covering fashion events in Philly the last few weeks and thinking I’d really like to see how it’s done in New York. Do you mind if I ask how you got a press pass–did you just request one for your blog or are you in the industry?